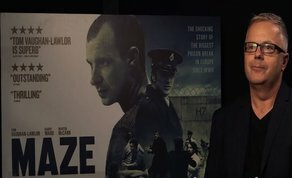 IFTN caught up with the writer and director of ‘Maze’, which is based on the true story of the 1983 mass breakout of 38 IRA prisoners from HMP 'Maze' high-security prison in Northern Ireland. The film stars Tom Vaughan Lawlor as Larry Marley, the chief architect of the escape, who schemes his way towards pulling off this feat, comes into contact with prison warder, Gordon Close (Barry Ward). Initially Larry and Gordon are confirmed enemies, born on opposite sides of Northern Ireland’s political divide, but when Larry realises that Gordon may be unwittingly useful for his escape plan, a slow seduction begins. Larry intends to use and manipulate Gordon in order to get closer to his goal but what follows is a tense, and intriguing drama in which an unlikely relationship is forged between two enemies that will have far reaching consequences for both of them. ‘Maze’ opens Friday 22nd September theatrically across 60 screens in Ireland. Lionsgate UK is the distributor. The film was financed by The Irish Film Board, RTE, BAI, Film Vast, Windmill Lane, Cork regional funding and Irish tax incentives for the film industry. The film is produced by Jane Doolan for Mammoth Films. In IFTN’s interview with Esther McCarthy, Stephen talks about what attracted him to the subject, shooting at the old Cork prison, funding the film, and how great Tom Vaughan-Lawlor, Barry Ward and all the cast is, and ultimately about how he wanted the film and specifically the relationship between ‘Larry’ and ‘Gordon’ to emulate the peace process.